The low-cost, high-speed Ting Internet service is expanding to new and larger markets, and investors are applauding. 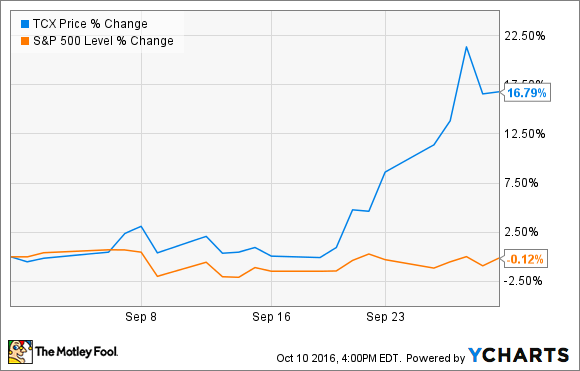 Shares of Tucows (NASDAQ:TCX) rose 16.8% in September 2016, according to data from S&P Global Market Intelligence. The jump was ignited on Sept. 20 by Tucows subsidiary Ting announcing the fourth and largest local market for its high-speed fiber network services. The fiber-based Ting Internet service offers gigabit networking to consumers for $89 per month, or $139 per month for business subscribers. If budgets are tight, Ting also provides a 5-megabit alternative for $19 per month. The recent expansion will bring Ting Internet to Centennial, Colorado. That's a Denver suburb with a population of 107,000. If that sounds small, consider that Ting's largest market to date is Charlottesville, Virgina -- home to 48,000 residents. Tucows CEO Elliot Noss telegraphed the Centennial expansion in a couple of ways. In August's second-quarter earnings call, he said the "pipeline of new cities is full, and we expect to be sharing additional locations before the end of the year." Noss also pointed out that there's a nationwide shortage of fiber-optic cable supplies right now, but Tucows has stocked up on fiber cabling and should be good to go. A couple of weeks later, Tucows set up a brand-new credit facility that's good for $75 million. Among other uses of that liquid cash source, the company highlighted "capital expenditures associated with the Company's Fiber-to-the-Home program." The company spent $1 million on property and equipment in the second quarter -- and 90% of this was earmarked for Ting Internet installations. "There are very few companies other than Google and ourselves that are doing what we're doing," Noss told the Denver Post. "Generally for us, communities are approaching us." So yeah, it was already pretty obvious that Ting Internet was going places. This business will be of central importance to Tucows' future prospects, and investors have plenty of reason to rejoice when Ting Internet breaks into spacious new territories like Centennial. What's Wrong With Tucows Inc. Today?